Insight from two years of research and trials in cities across the UK has been used to develop new techniques to encourage drivers to make the switch to the bus, helping to reduce congestion and carbon emissions. Collaborating with more than twenty bus operators, local authorities, passenger transport executives, charities and community groups, the Greener Journeys ‘Behaviour Change Lab’ has developed and tested methods through a series of projects in cities across the UK aimed at encouraging drivers to take the bus. The research findings and tested techniques have been compiled into a toolkit entitled ‘Driving modal shift from car to bus‘ which will be launched on the opening day of the Euro Bus Expo in Birmingham on the 4th November. Trials included targeting drivers when they are most likely to be frustrated with driving – such as when trying to find parking space, sitting in traffic or paying for petrol – and encouraging them to try using the bus with a free ticket. “Tackling car dependency will be crucial if we are to achieve an 80% reduction in CO2 emissions by 2050. Cars produce 58% of domestic transport emissions which as a sector is responsible for nearly a quarter of emissions in the UK. “Driving modal shift from car to bus will play an essential part in achieving the necessary reductions. This toolkit brings valuable new insights to this area, by examining new ways to overcome deeply engrained and habitual behaviour. The Greener Journeys Behaviour Change Lab began in February 2012 with the aim of confronting a fundamental challenge for Greener Journeys and the bus industry at large: what are the practical on the ground methods of getting people out of their cars and onto buses. The projects were developed to be complementary to existing work done by bus operators, moving away from conventional marketing approaches. Five ‘action-based’ experiments were run in different locations around the UK, each in partnership with a local operator and delivery partners. Projects were run in Sheffield, Leicester, Manchester, the North East and Bristol. 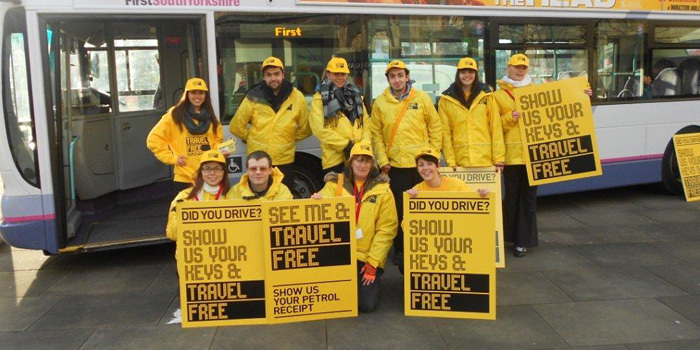 In total over 10,000 trial bus journeys were taken and 1,470 evaluation questionnaires were completed. Most of the approaches used free ticket mechanics, which helped drive trial and positive experience. Approaches working directly with community groups showed how it is possible to engage markets that are usually ‘hard to reach’. The new toolkit ‘Driving Modal Shift from Car to Bus’ will be launched on 4 November at 11.30 on the Environmental Stage at the Euro Bus Expo in Birmingham. More information can be found here: www.eurobusxpo.com. Greener Journeys is a campaign dedicated to encouraging people to make more sustainable travel choices. It aims to reduce CO2 emissions from transport by encouraging people to switch some of their car journeys to bus or coach instead. Switching from car to bus for just one journey a month would mean one billion fewer car journeys on our roads and would save 2 million tonnes of CO2 every year. It is a coalition of Britain’s leading bus companies and other supporters includingTransport for London, Campaign for Better Transport, the RAC Foundation, Passenger Focus, the Confederation for Passenger Transport (CPT), and the Passenger Transport Executive Group (pteg). Its primary funders are bus companies Arriva, FirstGroup, Go-Ahead, and Stagecoach. Behaviour Change is a not-for-profit social enterprise that tackles major social and environmental challenges by developing ideas that help people do the right thing. In addition to developing and running charitably funded initiatives working on food and energy issues, Behaviour Change takes on consultancy work for like-minded organisations such as Greener Journeys and were their partners on this project, delivering the city trials between 2012 and 2014. The social enterprise has also worked with the National Trust, developing their award-winning 50 Things to do before you’re 11 ¾ campaign, to encourage a new generation of sofa-bound children to rediscover the joys of den-building and tree climbing (www.50things.org.uk) and are working on the Love Food Hate Waste campaign for government waste reduction body WRAP. For more information, visit www.behaviourchange.org.uk.